In this quote, Swami Vivekananda tells us that the way to success is total immersion in a single idea – leaving all other ideas alone. Why does he tell us this? How does immersion in a single idea lead us to success? In this note, we attempt to find answers to these questions. According to Wikipedia, ideas are usually construed as mental representational images of some object. Ideas can also be abstract concepts that do not present as mental images. Ideas can also represent some methods or approaches (leading to innovations) or some formulations of thought (leading to some new arguments or theories). If one were to abstract from these numerous definitions of ‘idea’, one could legitimately describe an idea as a well-defined “space of thought”. 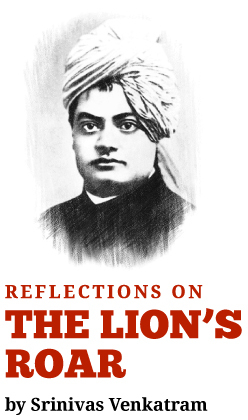 Swami Vivekananda says that the way to success is to plunge into a ‘space of thought’ – either a theory or frame, an innovation, a concept, or object – often connected with a mental representation – either clear or vague, in our minds. 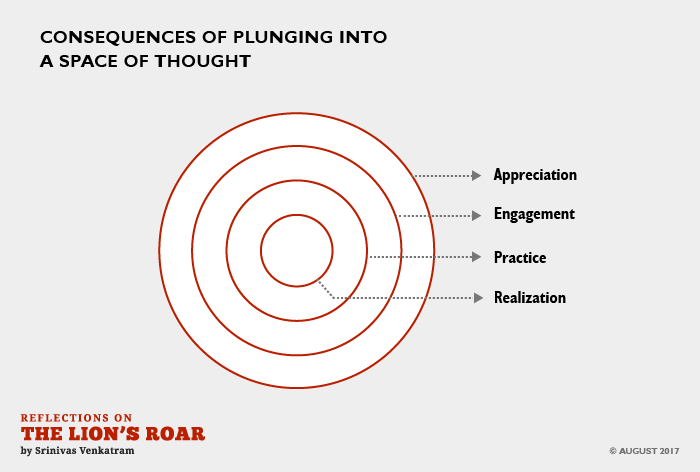 What happens when we plunge in (dive deep) into a space of thought? The first consequence we encounter when we plunge into an idea is that we begin to appreciate or discover the idea. The more we think about the idea, the more we see the linkages of that idea to the world at large – we discover its potential value, and encounter its many possibilities of manifestation. We also discover the potential for economic, social, and other forms of value in the world. Thus, we build conviction that the idea is valuable, and is worth pursuing in our lives. We also see the value of the idea to ourselves personally. We begin to discover potential pathways to make that idea a reality. And we begin to see that the idea has the power to significantly impact our own and other people’s lives. This conviction awakens in us the energy, the passion, to go deeper into the space of thought. Now the goal is not to discover the value and possibilities associated with the idea but to formulate a more vivid mental representation – a vision of what we are seeking. This process or journey of visioning is joyful and creative. It may be an individual, personal process of visioning. It may also be a collective, co-created process of visioning. It may also be a process where we may want to test out and formulate various components of the vision and let the overall vision form itself as a result. This visioning is not just a cognitive process, but a process involving energy, thought, the struggle with our own and others’ mental barriers, accompanied by sparks of discovery, innovation, and understanding. It is thus, a process that is hardly smooth, but it is joyful, involving and creative. As we engage deeply with the idea, what we get is not a mere representation or image of an idea, but a rigorous appreciation of what it means to live the idea. This difference is central to the whole process of ‘diving deep’ into an idea. At this stage, the idea has moved from being an impersonal thought or concept, however valuable, to becoming a proposition to us, personally, on how to live or do things differently from how we act today. This personalization or individualization of the idea is what draws out of me, “commitment” and the “will to succeed”. It is this ‘will to succeed’ that powers us and helps transform the ‘vision’ that we have, into real world products and accomplishments. Furthermore, this ‘will to succeed’ is accompanied by the practice of all that it takes to realize the vision. This integrated, and yet one pointed practice, leads to the development of all the necessary capabilities and components of success. At this stage, as individual components of the overall vision or story come into being, we become ready to encounter the next stage – a larger synthesis. As the successes build up, as the components or elements of the overall idea start taking shape and are (i) accepted by oneself as consistent with the vision; and (ii) accepted by the world as valuable; our attention moves to an overall synthesis – as we test the totality of what we have accomplished with the totality of the idea that we have immersed ourselves in. By this time, the idea as an objective entity may be mere words that we express, but the idea as a subjective entity has led to a total transformation of ourselves. We see that the idea is no longer a mere vision but has transformed into a ‘living ideal’ – a mode of living. We are one with the idea subjectively, and we are close to building the objective manifestation of the idea in the real world. Our very words carry the living conviction that the idea is real leading to an intuitive recognition in the world that we embody the idea in ourselves, and that we are living/ playing out the possibilities and the value creation – both for ourselves and the world – inherent in the idea. We have realized the idea. Realized its value. And realized its many possibilities. Success is the product/ side-effect of the realization of this idea in our lives.